The BALCS maximizes ballistic protection, buoyancy compensation, and load carrying capacity, while minimizing the burdens of weight, bulk and heat stress. Provides protection against fragmentation, handgun, and rifle threats. The armor system contains a soft armor vest; front and back interchangeable upgrade plates, and modular neck and groin protection. The neutrally buoyant soft vest is available in four sizes (S-XL); plates are sized with the vest. Approximate weight of a Medium vest is 6.5 lbs. ; the Medium plates are approximately 6 lbs. each. 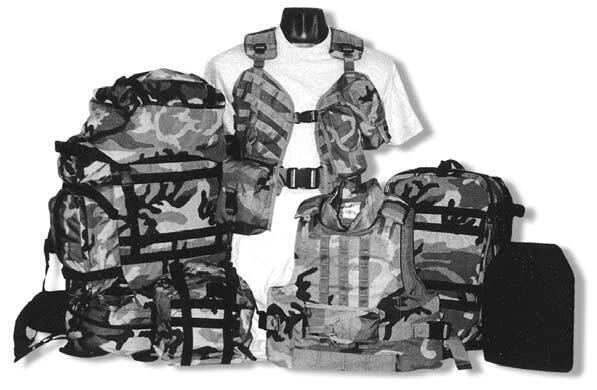 The modular pocketing and harness system allows mission tailoring of load and system configuration. The ELCS is compatible with the SPEAR Body Armor and Backpack Subsystem, and provides optimum compatibility with individual equipment and weapons.